Many orthotic labs grew up with AOMS 1.0. “AOMS 1.0” is a symbolic and collective expression, representing a DOS-based software package first introduced twenty-two years ago. Over the years, tens of millions of foot orthotics were produced using the AOMS 1.0 systems. The reason that AOMS 1.0 has endured for over twenty years is because it is professional, simple, reliable and efficient. Now, we are pleased to introduce AOMS 2.0. 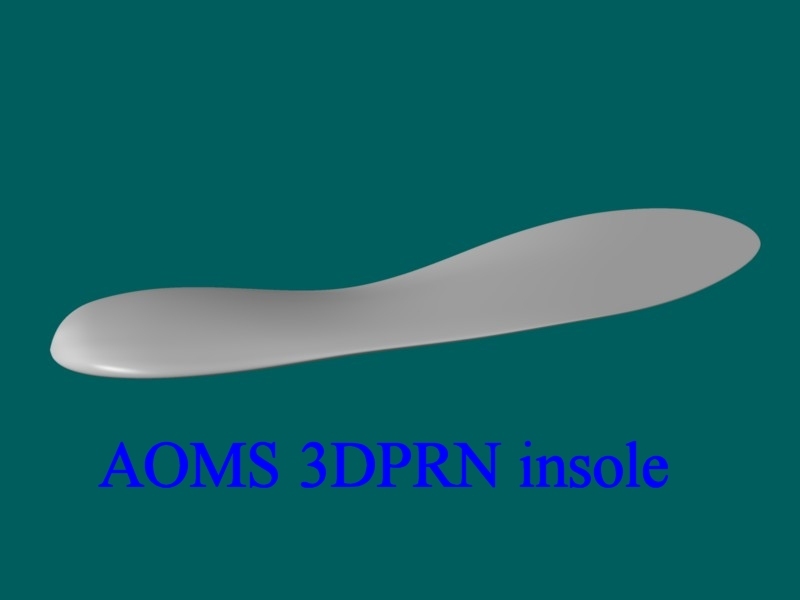 “AOMS 2.0” is a symbolic and collective expression, representing a Windows-based software package for automating orthotic production. It reflects a new wave of orthotic automation technology. It has inherited the legacy portion of the AOMS 1.0 and extended its capacities to the most advanced technologies, like 3D printing. 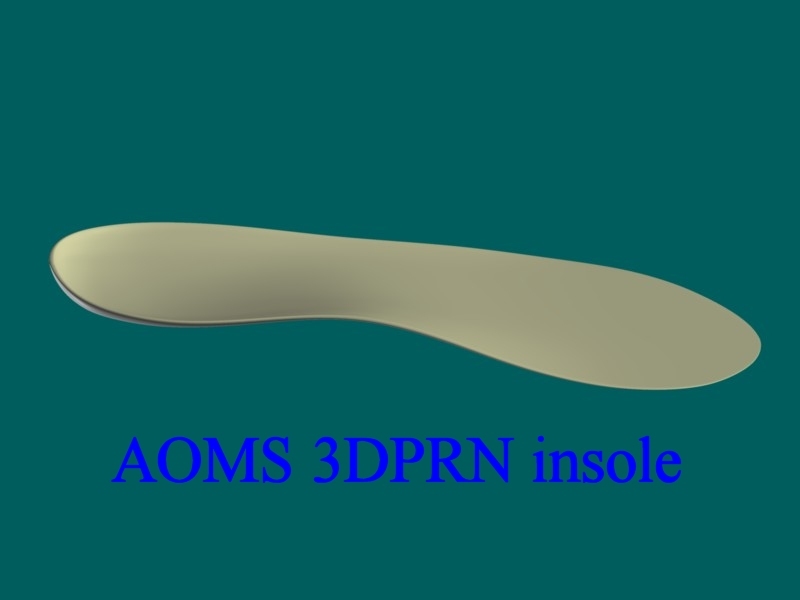 In fact, the first software package in the AOMS 2.0 category is the AOMS 3DPRN and it is a CAD/CAM software package for making foot orthoses through 3D printers. Our software is not used in 3D printers to make toys. Our software is used in them to make foot orthoses for the people in need. 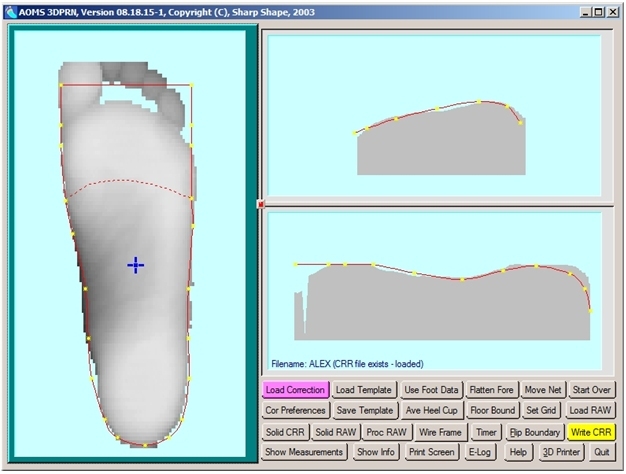 For the businesses which produce foot orthoses, our software products help you to make profit. This image is tested with my own foot. AOMS 1.0 had been used on computers with DOS, Windows 3.0, Windows 95, 98, ME, XP, Windows 7, and Windows 8. 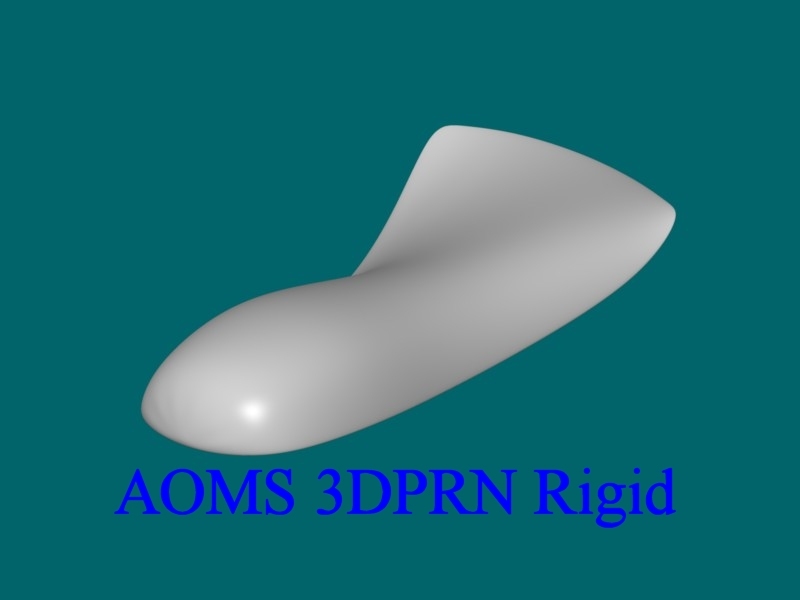 AOMS 3DPRN has been tested on Windows 7 and Windows 8. We plan to keep the AOMS 2.0 be compatible with Windows 10 and beyond. We are confident that many new labs will grow up with AOMS 2.0 and the existing AOMS labs can upgrade to AOMS 2.0. 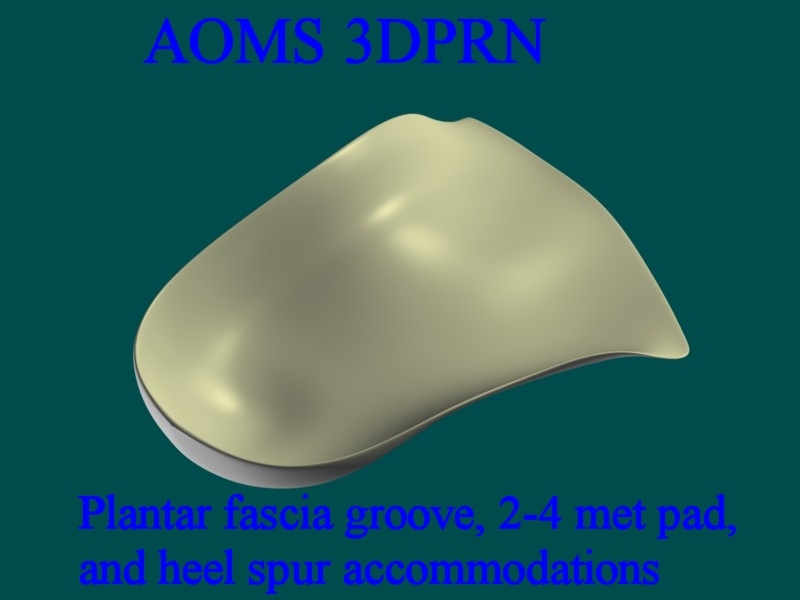 AOMS 1.0 is a centralized orthotic fabrication system. 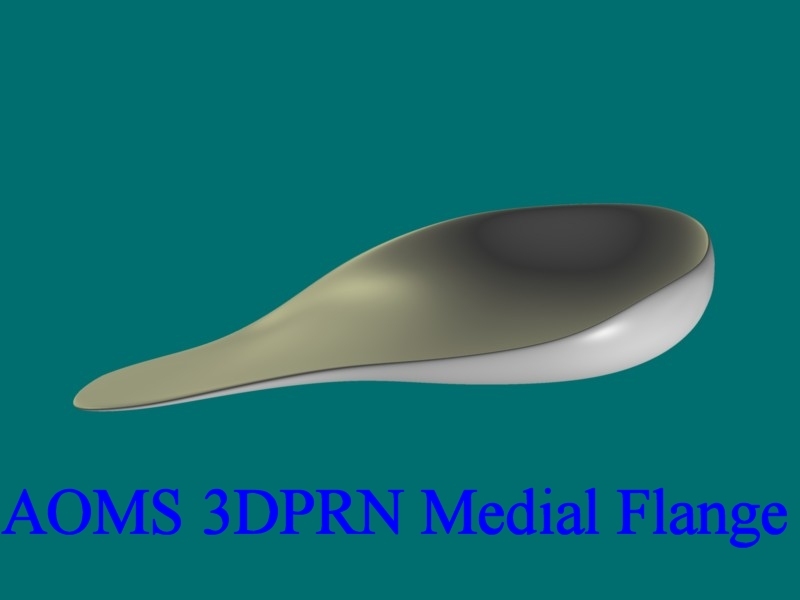 AOMS 2.0 moves towards a distributed, personalized orthotic fabrication system, although AOMS 2.0 can still be used as centralized orthotic fabrication system. This is because 3D printers can be small, inexpensive and can be used on desktops, but large and industial 3D printers do exist. This is my orthotic just printed on our own R&D 3D printer. 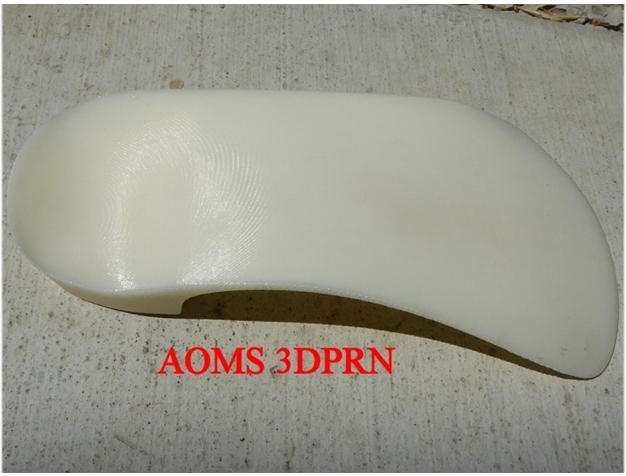 We developed our AOMS 3DPRN software based on our 22-year experience in the orthotic automation field, and based on the feedbacks relating to 3D printed orthotics that we searched online. Some customer commented that some 3D printed orthotics, "not even matching the shape of the foot". We feel that it is the #1 priority we have to deal with in our software. We need to make real custom foot orthoses. The 3D printed orthotic fits my foot. Maybe a generic shape is more appropriate for another application – shoe inserts. Our software allows you to make either the customized shape, or the generic shape. 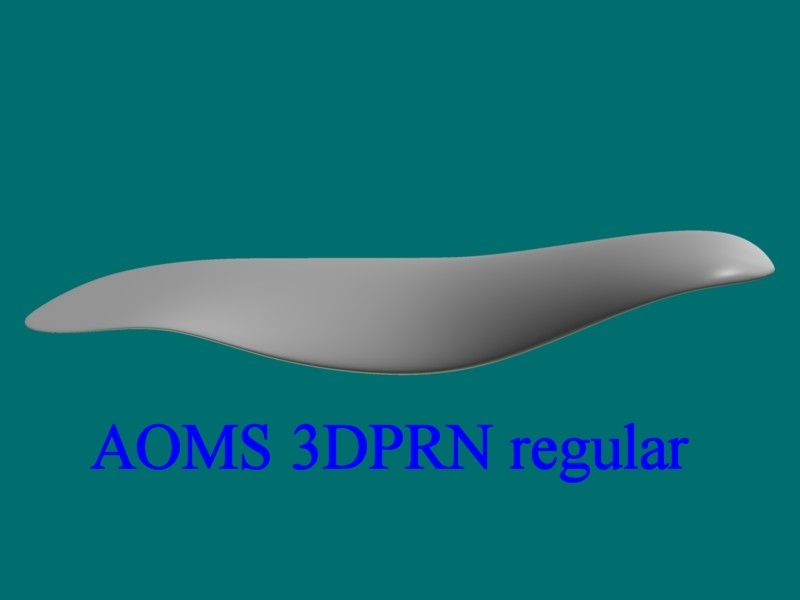 AOMS 3DPRN is the front wave of the new AOMS 2.0 waves. It is available now and in the beta testing phase. AOMS 3DPRN is relatively easier to install since a CNC milling machine is not involved. If a CNC milling machine is involved, we usually send a technician to integrate the system. CNC milling machines requires complicated setups and if not handled carefully, damage and injury can occur. 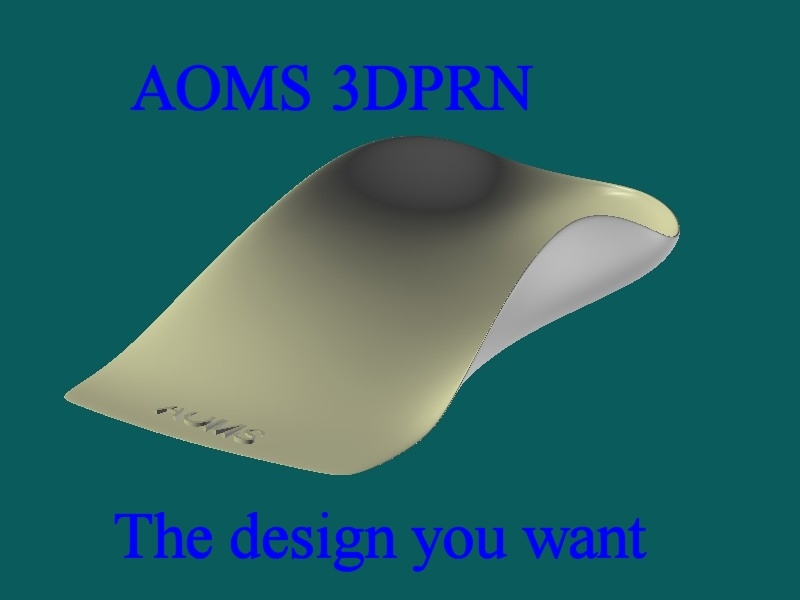 This is why we wanted to lead with AOMS 3DPRN to reveal the new AOMS 2.0 features. Other programs for CNC milling machine will follow. One big improvement over AOMS 1.0 is that AOMS 2.0 can make very round curves, like deep heel cups and high medial and lateral flanges. 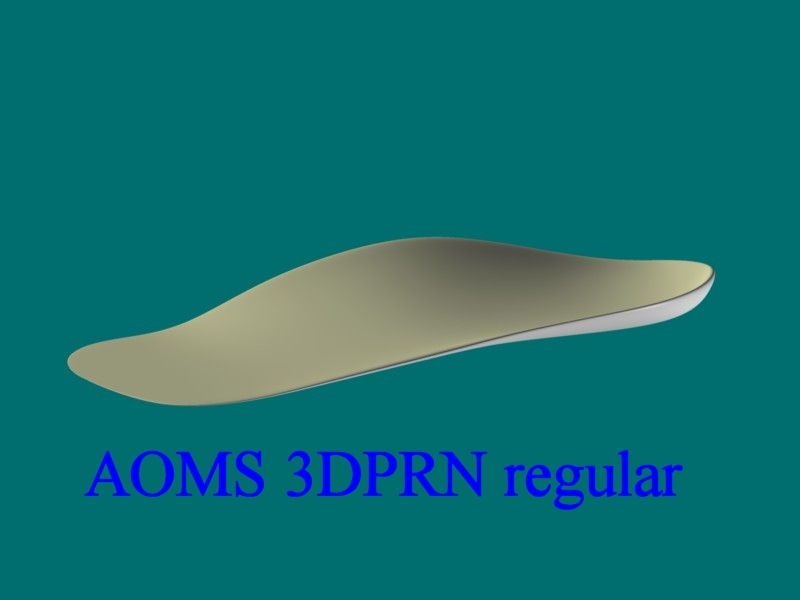 The original AOMS 1.0 could not make very steep curves. It was one of the critics we have learnt. 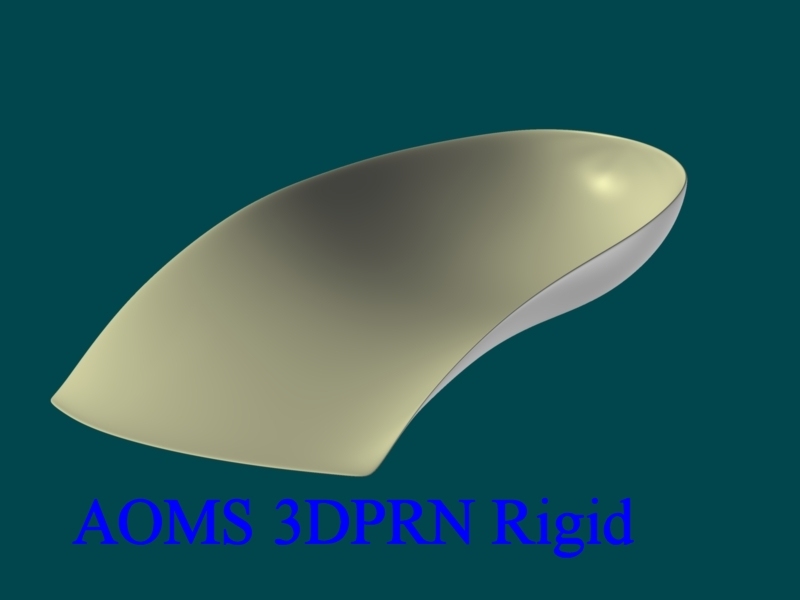 This round, smooth and ‘organic’ shape improvement has been tested in the AOMS 3DPRN project. In the future, we will use the same design software for the CNC milled orthotics and molds. 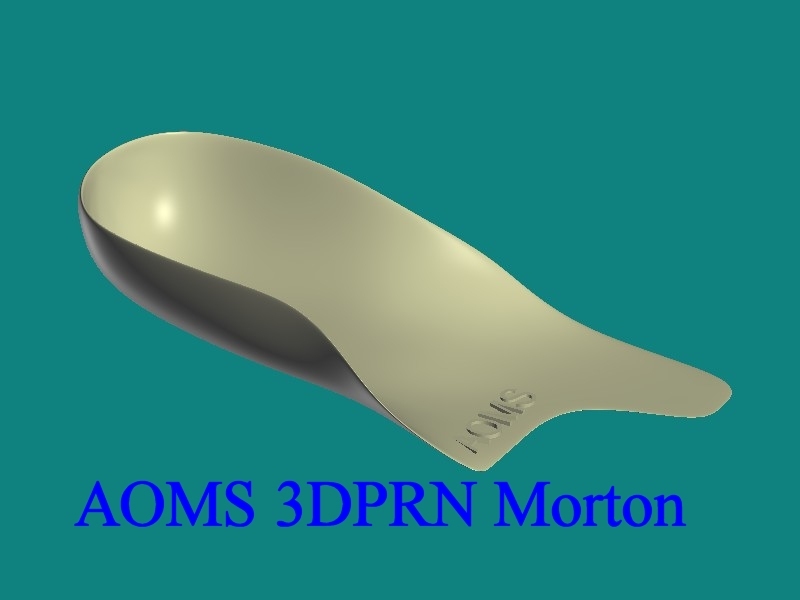 To demonstrate the capacities of the AOMS 3DPRN software, some sample screenshots and built orthotics are shown below. Some tests were made on our R&D 3D printer – MakerBot Replicator 2. We also sent out files for testing. We realized a lot of skills are needed for better 3D-printing orthotics. For example, the samples we built on our 3D printer are not as smooth as the ones built by a 3D printing company. Their orthotic does not show support materials. You will need to experiment with your 3D printer, or find a good supplier for 3D printing service. Note: some of the designs below require advanced skills. Some video clips were made to record the processes of making foot orthotics and molds. The main goal of the software is to design and build orthotic shells with 3D printers. 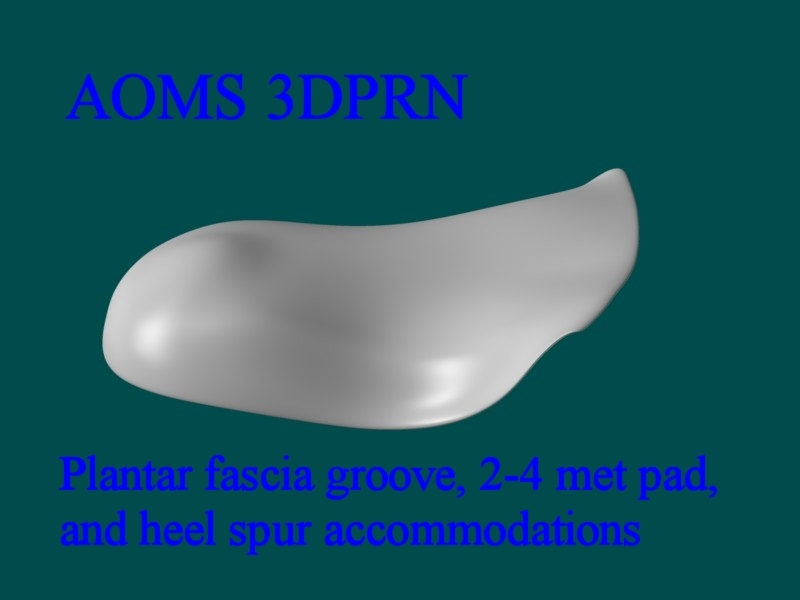 The software also has the ability to make positive foot molds. However, we think no one would want to use 3D printers to make molds for production, since the process may be too expensive to use. The video clip on the very left below is a software animation. The second one from the left is the real process of making an orthotic shell without heel post. The third one from the left is the process of making an orthotic shell with heel post. The fourth one from the left (far right) is the process of making positive mold. Note that for saving time and material, samples were made with hollow inside. In real production, the orthotics should be solid. Note how the orthotic is laid on the plate. You can make a choice about how to lay the orthotic in the MarkerBot software. If the orthotic is laid with the bottom-side down, the ‘supports’ are too much and they are hard to be cleaned. So we used a different angle to lay the orthotic on the building plate. You may have noticed the problem: the front of the orthotic has very littler ‘supports’ and the orthotic lifts up at the front. When we have more experience in the future, we may have ideas about how to prevent such problems. We know that the orthotic made by a 3D printing company does not show any ‘supports’. So we know there are ways to deal with the ‘supports’ issue. As in any new technology, there are still challenges ahead. We are still baffled by the fact that the 3D printed orthotic made through a prefessional 3D printing campany does not show ‘supports’ materials. We emailed a designed OBJ file to the company and they created the orthotic for us. The types of material are different too. The material we used is called PLA and they used a different material (look and feel different). Please refer to the photo below. With the 3D printer we have, we have to use ‘supports’. Without them, the printing process will end in trouble. We can rotate the orthotic to minimize the ‘supports’. If you do not want to handle the hassle from 3D printers by yourselves, you may want to contact a professional 3D printing company, at least to start with. Do you know that you can use an iPad scanner (with the Structure Sensor and the AOMS TOT app) to take foot images for the AOMS 3DPRN? Do you know that not all iPad scanners are the same? The one we use is well equipped with laser and patented technology. Our AOMS TOT app creates 3D OBJ data files generated from the depth sensor (the Structure Sensor), not just from 2D JPEG files or from video clips taken through the regular iPad camera. By adding the additional depth information, the 3D data is more accurate. AOMS TOT system requirements and tutorials can be found at www.sharpshape.com/aomstot.html. For brief description of the AOMS TOT system, please click the link or the photo: AOMS TOT System Information. 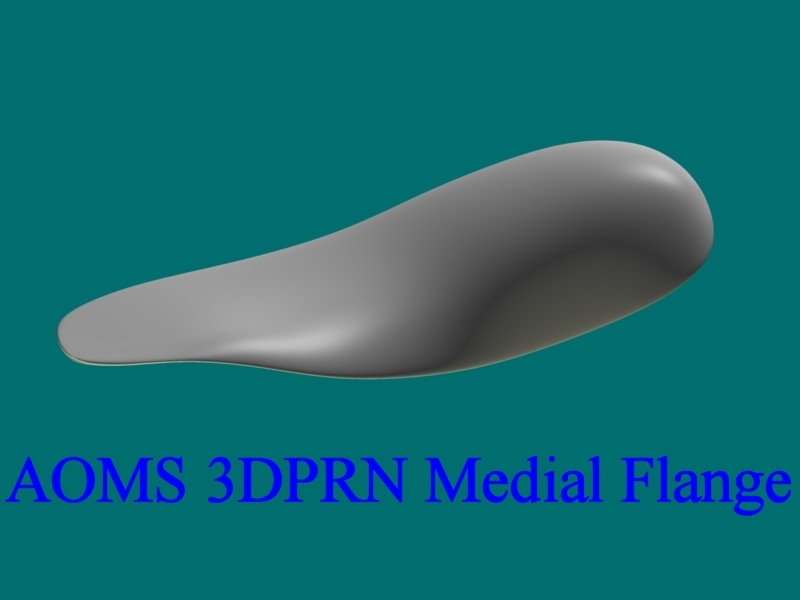 There are a lot of potentials with the new AOMS 3DPRN software. If you are interested in it or have any questions, please contact us. Please send us your feedback. More information will be added.